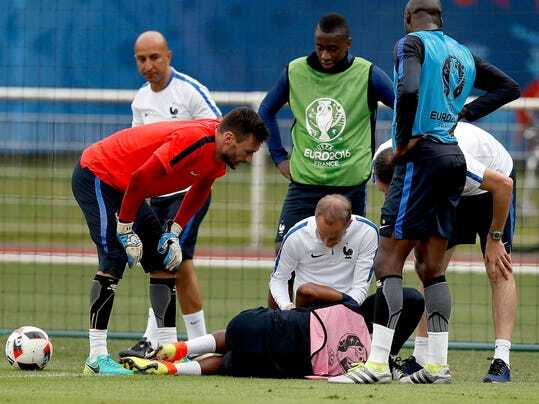 France left back Patrice Evra has made light of the minor hand injury he sustained in training. The 35-year-old Evra hurt his left hand when he fell following a collision with midfielder Moussa Sissoko late in Wednesday’s training session; with the team’s medical staff quickly applying ice and bandaging it. Evra, who was not wearing the bandage when he attended a news conference on Thursday, was in a light-hearted mood when a reporter asked about his injury. Evra is expected to start against Iceland in the quarterfinal at Stade de France on Sunday. Belgium captain Eden Hazard has returned to training ahead of the team’s European Championship quarterfinal match against Wales.